MoonStrike, for me, is a throwback to a genre of mobile games that I was addicted to for a short while. The game advertises itself as a boiled down real-time strategy game which is a true enough statement, but for those that played classic mobile games like Phage or Solarmax you’ll be instantly familiar with the core mechanics. The goal of this game is to take control of a galaxy against opposing forces while trying to defend your own territories. With a Motion tracked controller in each hand you can coordinate simple defensive and offensive tactics. 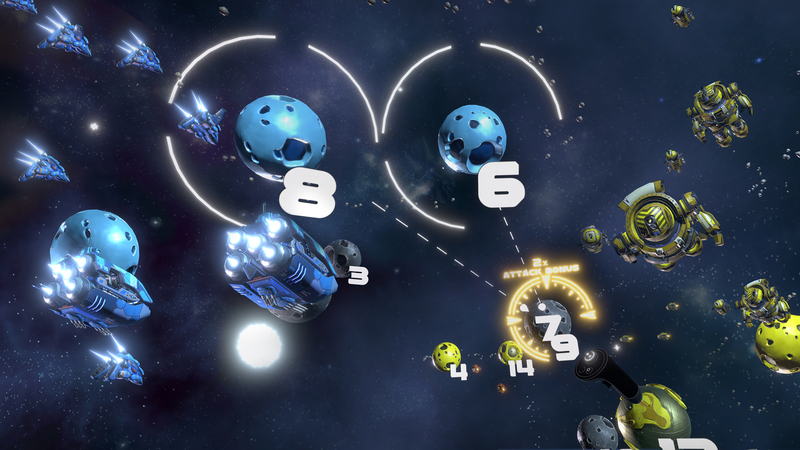 The game space gives you an overview of a galaxy littered with planets, moons and few other spacey objects which may be interacted with. Each player (human or AI) starts off with all of his or her troops on a single planet. While you control that planet, your troop count steadily increases with the goal being to control every planetoid in the stage, which turns into you army color signifying that it is yours. The more planets you take over, the more troops you create which are used to take over more planets. Each planet, prior to being taken over has a set number assigned to it with you needing to send more then that number in troops to take it over. Once that planet is in your control, or you enemies, whatever troops that are stationed there equate to the assigned number needed to take it over. If you assail a base without enough troops, you will fail, weakening the enemy and possibly leaving it open to an easy take over from someone else’s troops who may be following behind you. The key to victory is to expand you reach as fast as possible without losing any planets you have taken over, which can easily happen when you face 2 other opponents. The game looks really good with the galaxies and ships having a fair bit of detail and a miniature look to everything. Your controllers look exactly like Rift controllers, reminding you that you are in VR, but besides that everything else around looks cartoonish and fun. As planets accrue more troop points, reaching certain amounts will display bigger and more powerful looking ships. This is superfluous as combat is just a numbers games, but when you see a fleet of ships moving in on a singular target, each loaded with different ship types, it’s nice to see the variety. There are a variety of themed and randomized stages which don’t change up the look of the game too dramatically, but still do the job of making you feel like you are traversing the cosmos and taking over new galaxies. Sound is pretty bang on with everything making some kind of noise or another. The enemy you face will spout out some predetermined lines, smack talking you when they take over a base or threatening you as you advance on there core. Battles sound surprisingly epic with ships opening a barrage until a planetoid is taken over. There is no music that I can recall hearing during my time in the game, but with so much happening at any given time, I never noticed its absence. 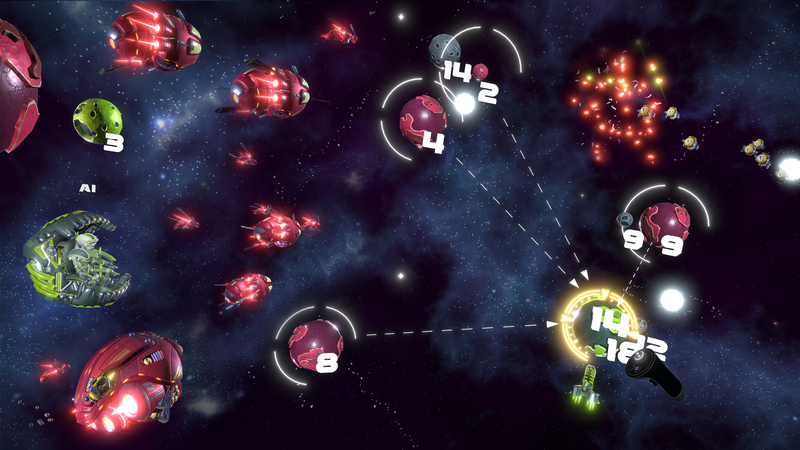 Moon Strike is a simple RTS game, but don’t let that fool you into thinking it is easy. There a few difficulties you can test your skills, but you will always face 2 other opponents, which keeps the challenge on harder difficulties as you now how defend your bases on 2 fronts. Multiplayer is supported as well with up to 2 other players, though you may have to organize a match outside of the game as the install base for this seems very light, or no one is looking for an online fight. I couldn’t test the multiplayer side of things but each faction you can choose from in the game has their own unique perks like faster travel speed in space or faster troop creation time as well a few others so pick which one you want though it should be noted that 1 or 2 appear to be the “better” options over the others which suggests there may be some balancing issues at play. There is also no campaign in here, just a skirmish mode that lets you pick your army, placing you in a randomized level. At time it gets pretty intense! Moon Strike is a fun, quick jaunt in VR but is limited by a lack of campaign and the rather barren multiplayer. That said, besides some balancing issues, I enjoyed my time with it. Ramping up the difficulty offers a ton of challenge and it is a thrill to pull yourself from the brink of annihilation to then further wipe out your foes and conquer the galaxy, I just wish there was more reason to come back this. Big Dorks Entertainment provided The VR Grid with a press copy for this title and, regardless of this review, we thank them for that!